Listed below are most of the available tools in CIAO which make use of the PSF information. Also linked are documents which explain their use. Applies the Lucy-Richardson deconvolution algorithm to 2D images. An observed source (left), corresponding PSF (center), and the deconvolved image of the source (right). 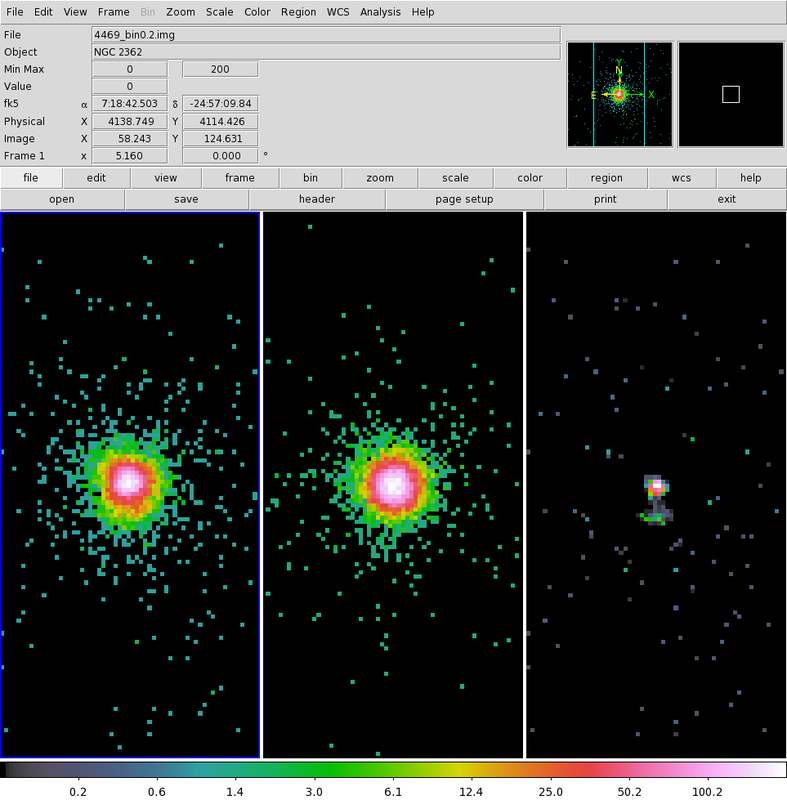 Its use and results are shown in the Using MARX to Simulate an Existing Observation thread. Computes values and bounds for source intensity quantities. Requires a PSF fraction, derivable from a PSF image, as an input argument. Provides the integrated radial profile (encircled counts fraction) of a 2D image or events file. The ECF profile generated from the fraction and r_mid columns of the output from ecf_calc. Its usage is demonstrated in the Using MARX to Simulate an Existing Observation thread. Legacy source detection algorithm that makes use of obsolete and inaccurate, built-in, calibration tables of PSF sizes at specific energy and encircled counts fraction arguments. 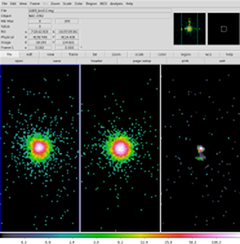 At any given position, the size of the detect cell is determined using this PSF information, where the cell size increases the further off-axis from the field of view center. This is a fast and robust method that works well for point sources without need for detailed PSF shape and only an approximate size; however, it has difficulties when handling extended sources and crowded fields; and is not particularly sensitive to faint sources. Source detection algorithm that correlates Mexican-Hat wavelets with an image and may use the PSF-size maps created by mkpsfmap as a tool input to help constrain detected source properties. This algorithm Works well for point sources embedded in extended emission and crowded fields, needing only an approximate PSF shape; however, it is memory intensive and slow, especially on large images and when many wavelet scales are used. Determine a region's radius for a given PSF-size and obtain the PSF fraction for a given region. Measures the source and PSF sizes for a 2D image and events file. 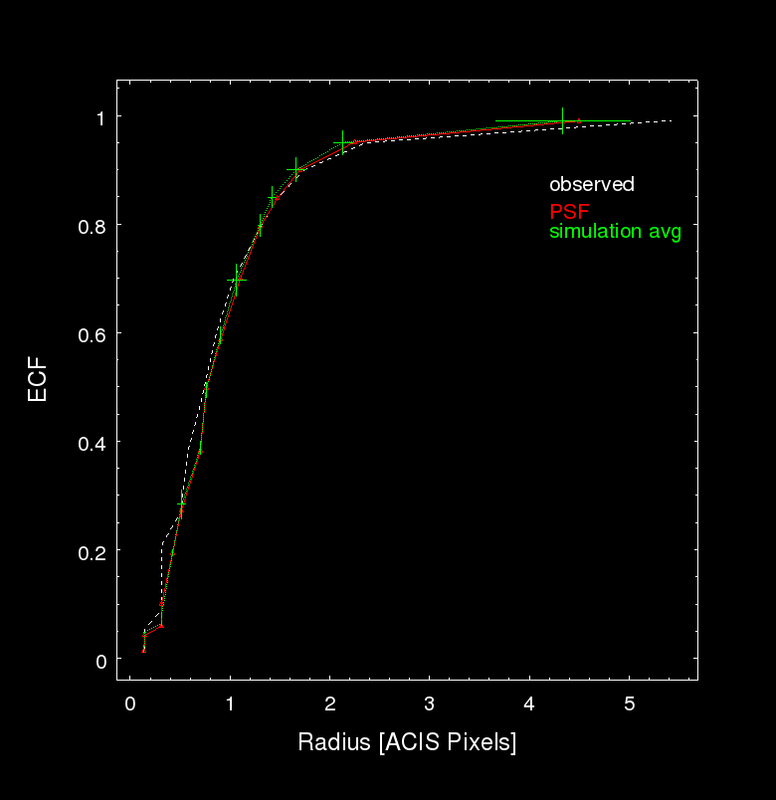 Calculates the net count rates and fluxes of sources in Chandra observations with PSF corrections. 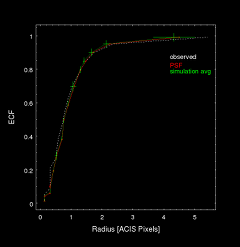 This figure conceptually shows the different psfmethod approximations used by srcflux. The "ideal" method assumes 100% of the PSF is enclosed in the source region; the "quick" method only for circular regions uses tabulated calibrations to calculate the PSF fraction in the source region and assumes the background PSF fraction is zero. 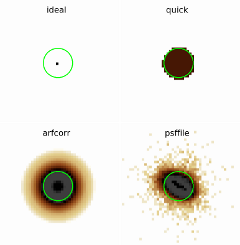 The "arfcorr" method runs the arfcorr tool at the characteristic mono-chromatic energy for the energy band to create a radially symmetric PSF model; and the "psffile" method uses a user-supplied image of the PSF. Uses calibration tables of PSF FWHMs ($CALDB/data/chandra/default/wpsf/hrmaD1996-11-01wpsfN0001.fits) as a function of off-axis angles to create region mask files that encompass the grating zeroth-order and dispersed spectra.